New Mum Online: How To Take the Stress Out of Starting School with Lunchbox Ideas. Aged 4 and One Quarter. How To Take the Stress Out of Starting School with Lunchbox Ideas. Aged 4 and One Quarter. This shop has been compensated by Collective Bias, Inc. and Capri-Sun/Tesco. All opinions are mine alone. You know that song, "I've got the key, I've got the secret" well seemingly in my house I have found the key to unlock and release the stress* of starting school. The secret it now seems was a lunchbox. Which is why I want to share my Lunchbox Ideas with you. 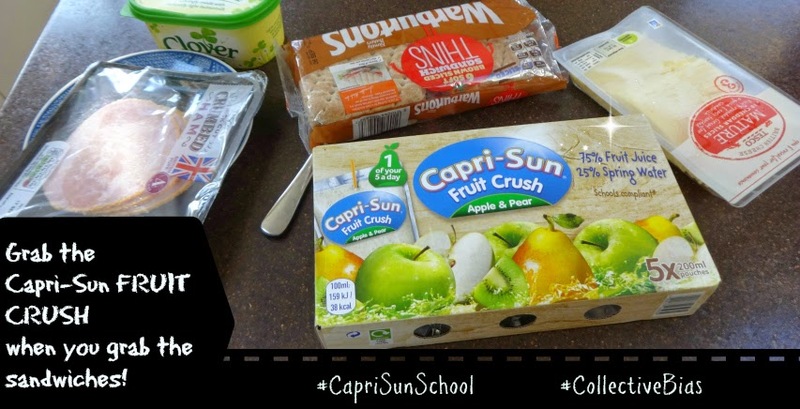 Who knew about the #CapriSunSchool lunchbox effect?!? I mean really, he is more excited than I have ever seen him on Christmas Day so much so that he even brought it to bed with him, and had breakfast out of it this morning. 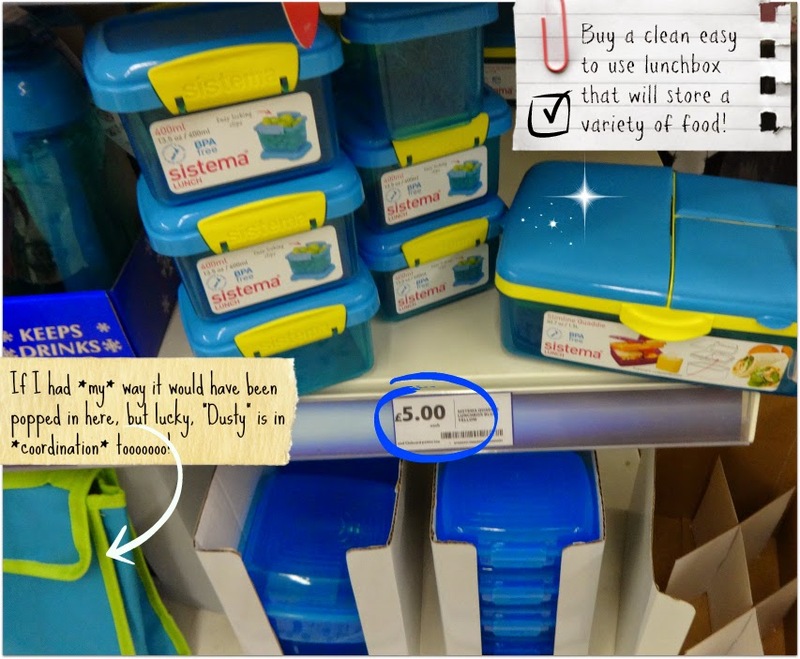 So make time and schedule in, amongst buying the shoes (which we are yet to do by the way), buying the uniform, labelling it, etc... and make sure you have your lunchbox and its contents all in a row. Before you say it, I know that school meals are now free for this age group, but I am SO glad that I have done this anyway, for the pure excitement it has lead to, and he might not like school food anyway - he already hates the look of the tables and chairs LOL! It's about them not you - what do they love? So this is all about the merchandise. For Aaron, at the moment, everything is about Dusty from Planes 2, but more on that in a moment. Getting it right. 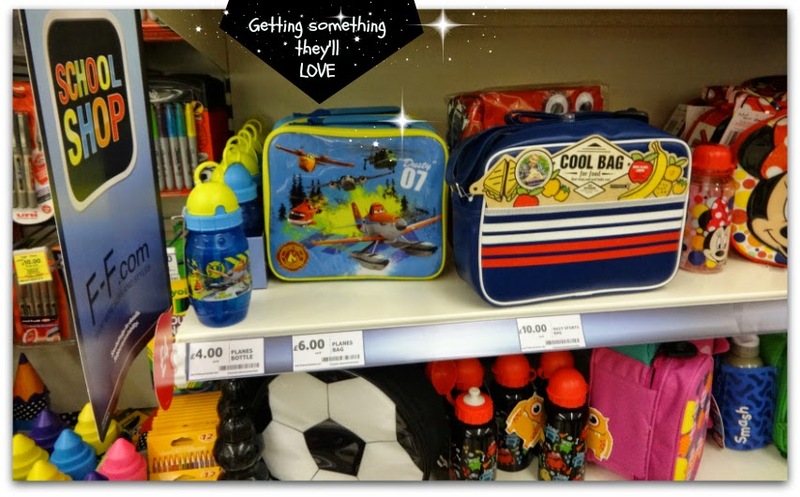 With a bit of me (an amazing plastic fantastic box) and a bit of him (a fab "Planes 2" Lunch Bag) I was able to arrive at the perfect combination and here's the fairy magic, they were the same colours!!! As if by magic!!! AND his first few hours of fascination were about opening and closing all the different sections, so getting a bit of what YOU like as well as what THEY like works. We created them after all :-) He had dinner out of it last night and breakfast this morning. He DID eventually focus on the Planes 2 aspect (in bed last night when he should have been sleeping) and we had to go online on my phone to name all of the characters on it (Dusty, Dipper, Blade Ranger, Windlifter, and Cabbie). Where does Capri-Sun fit in? Well, the plastic fantastic box, only fills 80% of the bag, which leaves just enough room to pop in a Capri-Sun Fruit Crush. Marvellous. I did of course get a Planes 2 Drinks Bottle, but (1) I have had bad experience of drinks bottles (making Aaron extremely ill if not washed properly) in the past and (2) the amount of gadgetry inside it only exasperates that. 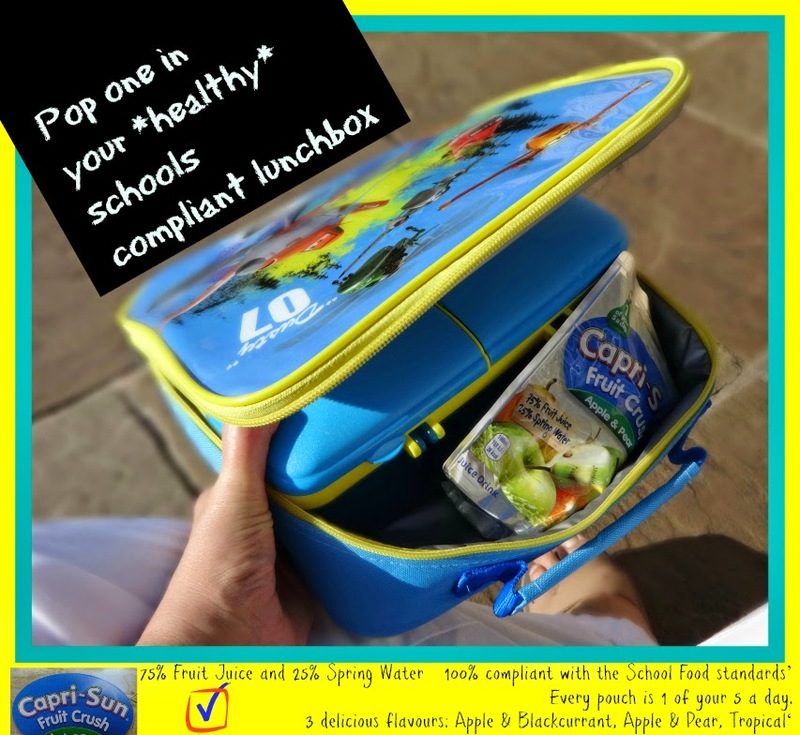 For hygiene reasons I think pre-packed Juice Drinks are the better Lunchbox solution - in particular Capri-Sun Fruit Crush as it is compliant with the School Food Standards (not heard of those yet - yep join the club - neither had I). By the way I provided a link there so you could fill your boots - they have been updated THIS Summer and some aspects fully come into effect January 2015. Well we're now going to be School Mums and that is ALL about compliance, so you may as well start early right? If you really want to swat up, have a look at the Childrens' Food Trust. Novelty "bread" keeping with the *new* theme: Warburton Brown Sliced Sandwich Thins. He's never had them before, but I figured they're must easier to grab, when surrounded in kids than a floppy sandwich. Luckily, I made him a sandwich when I got in (he wanted to use the sandwich box immediately, in the garden!) and he loves them. There are imaginative lunchbox ideas over on Capri-Sun's website. I love the Sistema lunchbox, as just like Bento Boxes, you can store a whole RANGE of food in there, and anyhow I haven't got into the whole Bento Box thang yet anyway. Healthy lunchboxes include a balanced diet. Capri-Sun Fruit Crush and this box make a winning combination in my mind. I've REALLY enjoyed this shop can you tell. It's a great storage box, and like I have shown, coordinates with the bag beautifully AND fits in it, WITH a Capri-Sun Fruit Crush. Tesco calls it a Sistema Quaddie by the way if you look for it instore or online. Other retailers don't seem to stock it in the same lovely colours either. Back to the Capri-Sun though. I found it in the soft drinks aisle, where the water also lives. I ended up having a long long chat with the member of staff there, who has looked after soft drinks for Tesco for 14 years. Love him! His old branch was about 3 aisles of drinks, but now he's in this one, with just one aisle, but as he is now 66, it's probably a good thing. It was so lovely hearing his story, I included him in my photo. Their whole family works for Tesco! 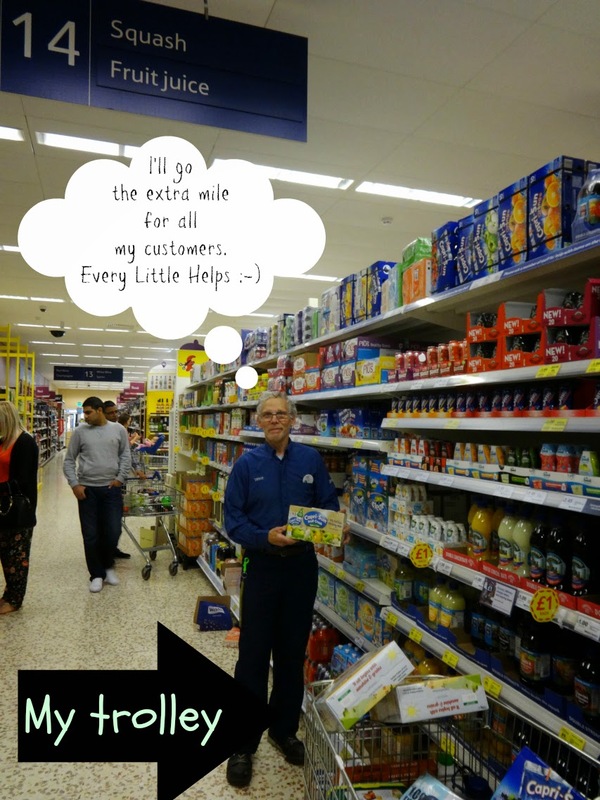 He runs the soft drink aisle as if it's his own corner shop. Knowing what sells, what needs stocking up, etc... Noticing what the shifts before his did and didn't do. He doesn't stand all day talking to customers. Not at all, he's very busy and focused on replenishment. The reason we spoke was because the first 2 or 3 Capri-Sun Fruit Crushes on the shelf were in wet boxes. They only had one flavour out of the 3 available as Capri-Sun Fruit Crush is popular. I have worked myself in retail for 24 years so I know retail is detail so I said to him your computer will be wondering why they are not selling. Those first 3 need taking away. He was very grateful for the information so I shared that I was there to write about Capri-Sun and Tesco so he agreed to be in my photo :-) Top man! 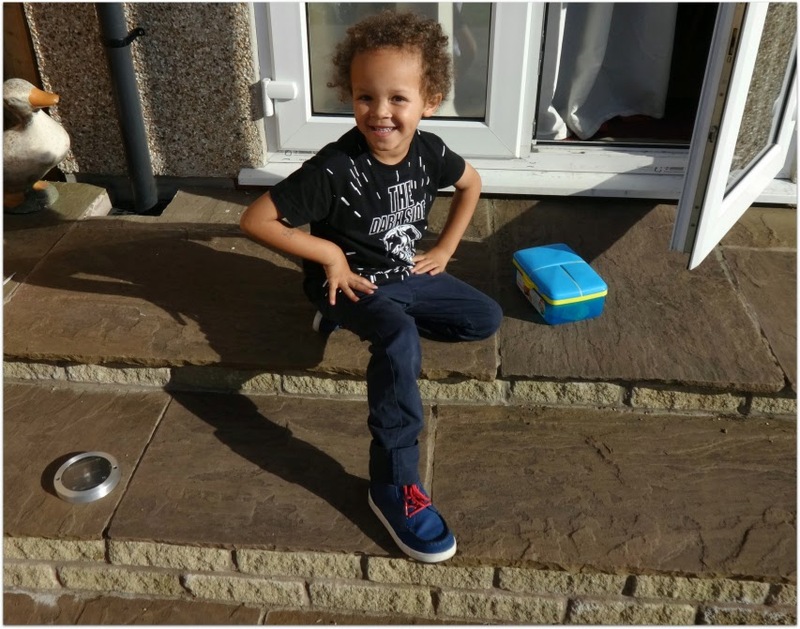 * The stress I mentioned at the start of this post was that Aaron didn't want to go to big school 5 days. Somehow he worked out that nursery was 3 days and school is 5 days and he has been fixated on that all Summer, to the point where, even if he just overheard someone talking about school he'd announce in a wining voice "do I have to go to big school?" "Do I have to go five days?"... We had that all Summer so we'd have to keep changing the subject and he wouldn't even cycle passed it. Going passed on the bus he wouldn't look out the window. If you love all things Capri-Sun then please take a look at Tesco's School Shop After School Capri-Sun Competition. So thank you so much for choosing me for this shop #CollectiveBias. I have my cheerful son back. He'll start school with a spring in his step, as he should. Just like I did, all those years ago. I wonder what was on my lunchbox. Daddy reckons his was Starwars. We have the same systema lunch box as you but with pink lids. The only thing is, we need a much bigger water bottle than the one provided so we use a separate one and use that big compartment on the top as another food section. We had plain Tupperware lunch boxes when I was at school. I need to grab those plain boxes for my big kids for senior school I think, they look great! 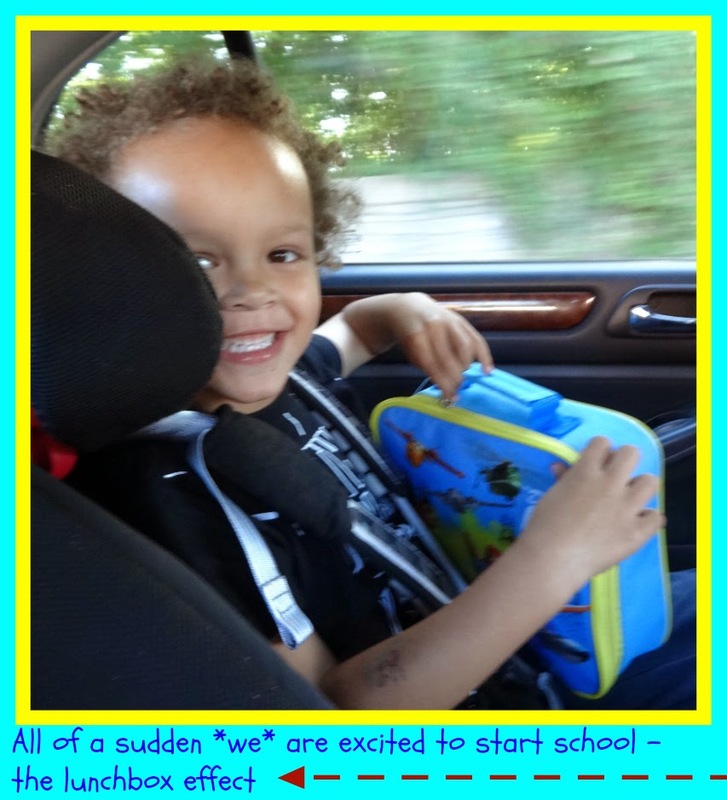 Looks like he's all ready for school and very excited about it too! Oh he has been dreading school ALL Summer holidays but now, thanks to a lunchbox, he's all excited. He's had sanwiches for lunch every day since I bought it and insists on eating them out of it. He loves the Sistema box and all its sections as much as me, so I did the right thing there. I can recommend them.